Check out the cute, wearable character blanket wrap. Enter contest below to win a set of different wraps. So if you’re looking for some adorable winter wearables, look no further than your local Walmart store where you can find these cute offerings in the Sleepwear section or online at Walmart.com. 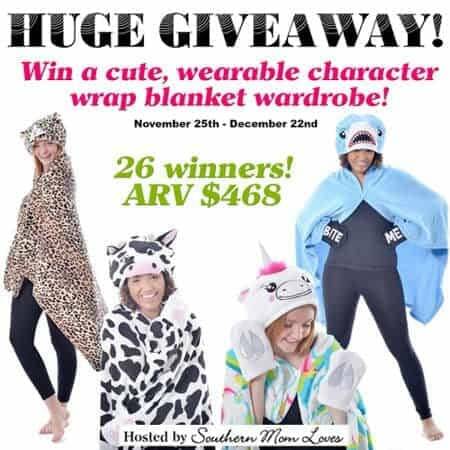 Then enter to win a full blanket wrap wardrobe below! Giveaway begins on 11/25/16 at 1:00 am CST and ends on 12/22/16 at 11:59 pm CST. Must be 18 years or older, open to residents of the US only. Once confirmed, the winners will be added to the Southern Mom Loves Winner’s List. Disclaimer: Work Money Fun and other participating bloggers were not compensated for this post. No purchase is necessary to enter. One entrant per household, per address. All entries will be verified. Void where prohibited by law. Winner will be contacted by email; Please add [email protected] to your whitelist. Richard Leeds International will be responsible for blanket wrap prize delivery to the winner. This giveaway is in no way administered, sponsored, endorsed by, or associated with Facebook and/or Twitter, Google, Pinterest, or any other social media platform. These blankets are adorable! My favorite would be the shark – it’s a got a little sass with the “bite me” on it. Love that! These are so cute! I’d love the Minion blanket. Mionions are just so adorable. I love the cow, but really, they’re all so adorable! I really love the black and white tiger-striped wrap because I just think it is so darned cute! I really like the leopard one. Happy Holidays! I love the one that looks like a cat on the left side of the picture (I searched several minutes and couldn’t find the names to match the products) because I love animals, I am, I am afraid, a cat lady, and I love adorable, soft things!